Man has sought these “crossroads” for millennia, in bands ranging from hunting parties to Civil War armies – following the river west into the Appalachian back country, or fordoing the shallows along major north-south trails that ran from Quebec to the Carolinas. The earliest settlers were Indians whose garden patches were set on alluvial flats and large islands, and 18th century Germans and English, whose paths crossed along the Monocacy and Potomac rivers. With the latter came the “longboat” for river travel, and the hand-poled ferry for use at major crossing points. At normal water levels, strong paddlers can do the 17.5 miles to Edward’s Ferry in about seven hours; at high water, swift currents cut the time considerably. For a chance to study and explore, spread the trip over two long afternoons, the first spent among Graffenried’s “enchanted islands” above the Monocacy and the second from the Mouth of the Monocacy to Edward’s Ferry. The canoe put-in at Point of Rocks is under the route 15 highway bridge. To reach it, pass the train station, turn left on a side road across from Ballenger Creek Pike. Cross the railroad tracks and canal on a wooden bridge, and go to the right along the towpath for a short distance. Overall, the scenery is pleasant. The quiet peacefulness of the river, however, is interrupted with motor boats. The wakes of these crafts make waves that require vigilant bracing to keep the canoe stable. A region of major Indian and colonial river crossings, this section includes early north-south trails and fords at and around Noland’s Ferry (mile 3.8). Near the main crossing in Loudoun County, Virginia, is the Jeffrey Rock Shelter, where excavations have revealed thousands of years of aboriginal use, probably by hunting parties. Heater’s (or Conoy) Island saw the last stand of the Piscataway Indians in the Potomac Valley, and the visit of the Swiss explorer von Graffenried, who ventured up river as far as Point of Rocks in 1712, enticed by the rumor of silver mines. After the Revolution, the lower Monocacy River became a vigorous industrial center with mills and iron works developed by the Johnson brothers of Frederick County to exploit markets along the nearby roads and trade routes. Catoctin Ridge, above Point of Rocks, is all that remains of a large fold that developed when the Appalachians were squeezed and uplifted several hundred million years ago. Exposed along the B&O Railroad cut are the altered remains of a billion-year-old lava flow (the “Catoctin greenstone”) topped by rocks about half as old that were probably an ancient beach deposit (the Weverton quartzite”). Development of the town was spurred by the construction of the C&O Canal and the B&O Railroad, which arrived together in the early 1830’s, sponsored by rival promoters in Washington and Baltimore. The goal of both projects was the rich trade of the Ohio Valley, and both looked to the Potomac Valley as their route west through the Appalachians. Unlike the railroad, the canal was unable to cross the Alleghenies west of Cumberland, Maryland, and when the Metropolitan Branch of the B&O was completed to Point of Rocks from Washington in 1873, the canal’s demise was assured. For years, Point of Rocks served as a watering point for B&O steam engines and as a transfer point for sandstone boated up-canal from quarries at Seneca for rail shipment to Baltimore. The two rivals built the last and most important Potomac “highways” to the west, their junction here provoking a contest for rights-of-way at the foot of Catoctin Mountain that involved such legal giants as Daniel Webster and Roger Brooke Taney. The present highway bridge carries Route 15, a modern relocation of the old “Carolina Road,” the region’s major north-south artery. On the Virginia side is “Furnace Mountain,” site of still another Johnson iron furnace. By the late 17th century the Piscataway Indians (called the Conoys by the Iroquois) had been pushed out of their southern Maryland Homeland by the English, and after several years in Virginia had settled on Heater’s Island in 1699. Here they planted crops and built a stockaded village, but after an outbreak of smallpox in 1711, abandoned the Potomac and sought refuge in Pennsylvania. Heater’s Island is about a mile and a half long, and just below the head is a characteristic V-shaped fish weir that runs from there to a small island near the Maryland shore: in normal and low water look for V-shaped ripples or a loose-rock dam piled into a “V,” with the point downstream. Fish forced into the weir made their way down to the point which was usually blocked by a net or basket. This trap, and similar ones, are thought to be of Indian origin, but may have been used in Colonial days. For an interesting side trip go down the Virginia side of Noland’s Island and through a chain of small, unnamed islands; head back to Noland’s Island and round the tip to see the former site of Noland’s Ferry just up river on the Maryland shore. 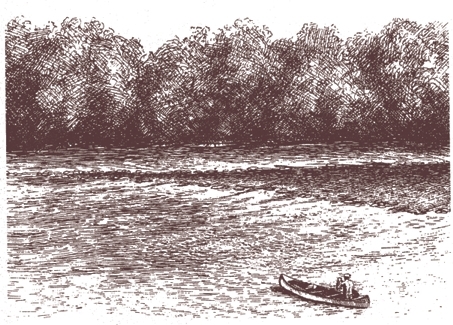 The lower third of the island, below Noland’s Ferry, is a “gift” of the white man – built of topsoil washed down the river since Colonial days. Look for a small boat-launching ramp on the Maryland shore, just below a large stone building that houses a Frederick County water intake. You can canoe back and put ashore there; walk over to the C&O Canal, and find the sandstone abutments that once carried the old road over the canal to the ferry. Ancient war and hunting paths crossed here and, in the 17th century, an Iroquois path that ran across the Maryland and Virginia piedmont to the Carolinas – followed in colonial times by the famous Carolina Road that carried settlers and commerce. By the 1750’s Philip Noland was operating a ferry, but a century later the depredations of “highwaymen” had forced travelers to abandon the crossing. Although the modern highway bridge is four miles west at Point of Rocks, other parts of modern Route 15 follow the old Carolina Road exactly, especially south of the river. George Washington used this road and Noland’s Ferry, and during the Revolution, Anthony Wayne’s regiment splashed across en route to Yorktown. Look for the mouth of the Creek on the Maryland shore not far below the tip of Noland’s Island where a large red-sandstone culvert carries it under the C&O Canal. 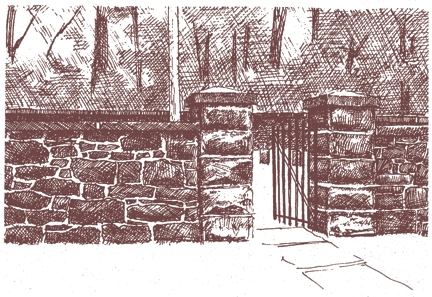 To see the fine stone work executed by the canal builders, canoe up the creek and into the culvert. After the canal closed in 1924, local residents punched holes into this and other culverts to drain stagnant rainwater from the old canal ditch. In 1712-14 bands of Tuscarora Indians camped in the area after a losing struggle to retain their ancestral homeland near New Bern, North Carolina. Defeated by the English, scattered bands wandered north (to New York State) to join their Iroquois kinsmen of the Five Nations – later becoming the “Sixth Nation of the Iroquois Confederacy. The creek retains the Iroquoian name, as does a small settlement and post office a few miles north. Another interesting side trip is back across the river and down the channel between the two halves of Birdsaw Island, then down the Virginia shore past Cox Island. Near the head of Cox Island, where a small Loudoun stream empties into the Potomac, is a perfectly preserved fish weir. Look for the C&O Canal Aqueduct, and just beyond, the major engineering work of the Metropolitan Branch of the B&O Railroad – the Monocacy River Viaduct. Here you may paddle up the Monocacy for a side excursion. It drains the rich Frederick Valley from head springs near Gettysburg, Pennsylvania, and was once a major canoe route and north-south trail for the Indians. In the 18th century, English settlers pushing up the Potomac from “tidewater” introduced slavery and tobacco cultivation to the region, and commingled with German families who had followed the Monocacy Valley down from Pennsylvania. The Germans brought the “family farm” and an agriculture featuring small grains, orchards, livestock and the imposing bank barn. The Potowmack Company, founded and directed by George Washington from 1785-89, had prominent backers in Thomas and Roger Johnson of Frederick, whose iron industries later dotted the lower Monocacy valley astride the region’s major trade routes. These men had long dreamed of shipping western goods and produce down the Potomac to tidewater ports at Georgetown and Alexandria and of tapping major tributaries like the Monocacy, whose prosperous farms and mills enjoyed a well-established trade with Baltimore. After years of delay, the Potomac was opened for longboat navigation as far as Cumberland, Maryland (150 miles west), but projects to clear the Monocacy were sporadic and short-lived. The Potomac and its tributaries were too shallow much of the year to carry even longboat traffic, and by 1828 the Potowmack Company had relinquished its rights to develop river navigation to the C&O Canal Company. This seven-arch stone aqueduct was completed in 1833 to carry the C&O Canal 516 feet over the Monocacy River. The stone was quarried near Sugar Loaf Mountain, about six miles east, and carted from the quarries on the wooden tracks of one of Maryland’s earliest railroads, built by the contractors for just that purpose. You can put ashore to look for rope burns cut into the iron railings at either end of the aqueduct – the signature of generations of mules and tow-ropes. Because of the continual effects of weather and river, the stability of this beautiful structure deteriorated during the 20th Century, necessitating a major rehabilitation project. That project was completed in 2005, ending with a rededication ceremony in May of that year. Because of the renovation, the Aqueduct will be a treasure for future generations to enjoy. Built in 1873 to carry the Metropolitan Branch of the B&O Railroad over the river, it was raised and strengthened about 1900. Years before, stone columns for the Capitol had been quarried from sandstone bluffs above White’s Ferry and shipped downriver in longboats. The 1830’s brought C&O Canal traffic, and the abortive effort of Virginians to extend canal navigation up Goose Creek to link Loudoun County farms and mills with the C&O Canal and the markets of Georgetown and Alexandria. Behind the trees on both banks, and occasionally outcropping in prominent bluffs on the Virginia shore, are red-sandstone cliffs cut by the Potomac over millions of years. The “redstone” deposits laid down in Triassic times (a relatively brief 200 million years ago), extend irregularly from New England to the Carolinas. This is an old crossing below the Monocacy that kept its name long after the ferry quit operation. Confederate regiments invading Maryland on September 5, 1862, forded the river at Spink’s and Noland’s Ferries, and at White’s Ford. They were observed by a Union signal station on Sugar Loaf Mountain which wig-wagged the alarm to a signal station near Frederick. This massive set of structures is a coal-fired generating plant which began operations about 1959. The original 400 foot chimneys are dwarfed by the large 750 foot stack completed in the late 1970s. A fourth stack, shorter and wider, was added in 2009, and is a scrubber designed to remove sulphur and nitrogen oxides from the fluegas. On the river bank is a large concrete water intake, built to its present configuration to accommodate the flood pool of proposed river dams that were never built. Also sited just south of the Pepco plant is the Montgomery County Resource Recovery Facility marked by a chimney of 275 feet. This facility was brought into service in about 1990, and burns trash to generate electricity. The trash arrives by rail from the transfer station in Shady Grove. Twice again later in the war, large bodies of Confederate troops, returning from campaigns into Pennsylvania and Maryland, crossed here. Take the Maryland (left) channel which leads to two fish traps and the site of an abandoned marble quarry. On the Maryland shore, just above a channel that bisects Mason Island, is an overnight Hiker-Biker camp adjacent to the canal; in the bluffs beyond is the site of a quarry drawn upon by Benjamin H. Latrobe in rebuilding the Capitol about 1818. Large stone columns were hewed out and shipped downriver in longboats; they can be seen today in the Old House Chamber (now the Hall of Statuary). The “marble” is really a conglomerate rock interbedded in the more common red sandstone. The stone retaining wall was built by the C&O Canal Company to prevent bank erosion. Along much of Mason Island the canal towpath and ditch are just uphill from the river. The last working ferry on the Potomac River, it is now the only Potomac crossing in the 40 miles between Cabin John and Point of Rocks. In operation for over 150 years, it was the “upper” ferry connecting the rural trade centers of Poolesville (MD) and Leesburg (VA), and quickly developed into an important storage and shipping point for farmers trading on the C&O Canal. One of the earliest Montgomery County roads, River Road, still ends at White’s Ferry; just across the river is Route 15, following the line of the old Carolina Road. Up the road from the ferry on the Maryland side are the stone foundations of a former grain warehouse, and the ruins of a bridge that once carried wagon traffic over the C&O Canal. In this part of Montgomery County, where roads were poor and the railroads far away, farmers brought their grain to shipping points on the canal like White’s Ferry, and picked up lime and fertilizer boated from Georgetown and Alexandria. On Civil War maps it was “Conrad’s Ferry,” and became “White’s” Ferry only after the war when it was purchased by a celebrated former Confederate Cavalryman, Col. Elijah V. White of Leesburg. This large floodplain island is still farmed. Take the channel on the Virginia side. Just before reaching the head of a small island close to Harrison Island, look for the mouth of a small stream on the Virginia shore: it has built a muddy delta where, in summer, much debris is often left by fishermen. From here, a trail runs inland and up a steep sandstone bluff to the Ball’s Bluff National Cemetery, about a five minute walk from the river. The sandstone bluff is “Ball’s Bluff,” where, on October 21, 1861, 1700 Federal troops were routed by Confederate troops garrisoned at nearby Leesburg. Four Federal regiments had crossed the river the night before to make a “slight demonstration” against Leesburg, led by a friend of Abraham Lincoln, Colonel Edward Baker, an enthusiastic but inexperienced commander. By mid-afternoon of the 21st, Baker had been killed, and his forces – fighting from an inferior position on top of Ball’s Bluff – saw their slow retreat turn into panic as confederate troops made a determined bayonet charge. Trying to retreat across the river, soldiers jumped, slid or fell down the nearly vertical bluffs, and at the bottom found few boats available to ferry them across the rain swollen channel to Harrison Island. In the general rout, boats loaded with wounded were swamped, and scores of men drowned or were cut down by rifle fire as they tried to swim for it. In the small cemetery on the top of the bluff are buried a few Union soldiers, most of them unknown. Nearby stones mark the grave of a lone Confederate and the spot where Colonel Baker was mortally wounded. Just below Ball’s Bluff is a fish weir, still in a perfect “V” thought by some archeologists to be several thousand years old. After passing Harrison Island paddle down the Virginia shore another two miles to the mouth of Goose Creek, a major tributary that drains a large watershed in Loudoun County. Since the C&O Canal lies just across the Potomac at Edward’s Ferry, a project was begun in the 1830’s to canalize Goose Creek and build locks around the rapids so Loudoun farmers could ship their grain to Georgetown and Alexandria by canal. Boats that navigate Goose Creek were poled across the Potomac and into the C&O Canal through two “guard locks” that were constructed just below Edward’s Ferry. Work on the project was slow and costly, and few if any cargoes ever navigated significant stretches of Goose Creek. 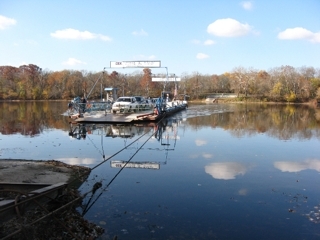 The “lower” ferry connecting Poolesville and River Road to Leesburg, this was – like White’s Ferry – an important storage and shipping point for local farmers. At the canal is Lock 25 and the locktender’s house, and just below, the ruins of a former store. A few hundred yards below the store are the two “guard locks” that gave grain boats access to the canal. Shortly before the Battle of Gettysburg, the Union Army of the Potomac crossed the Potomac on pontoon bridges laid down on either side of Goose Creek. Robert E. Lee’s Army of Northern Virginia had already crossed the Potomac at Williamsport, about sixty miles upriver, and was marching east when the Federal Army, cautiously keeping between Lee and their own capital city, crossed here on June 27 and 28 before marching north to join battle. Edward’s Ferry is the take-out point. Today the weedy, isolated river bottom gives little hint of its days as an important crossroads – too far from the railroad and major highways, its end was signaled when the C&O Canal closed in 1924. Ferry operations ceased in 1936, and fire and the 1972 flood claimed the remaining summer cottages and fishing camps. To see the old hand drawn Trail Guide site maps for the Potomac Crossroads Canoe Trail (now out of date), please go here.